Looking for a lean, toned stomach? As a personal trainer, this is what most new clients ask me for. This is considered as the ultimate goal in most fitness plans but this so hard to do for most people no matter how much they exercise. You may have tried doing tons of abdominal exercises and given up and I wouldn’t blame you for doing this. You have to forget about just doing crunches because this alone won’t give you rock hard abdominals. The idea that crunches alone can give you rock hard abdominals is a myth as this will never work for you. If you try to spot reduce with exercise alone this simply won’t work for fat loss and a ripped stomach. Spot reducing simply doesn’t work. You can only get a reduction in fat with clean eating, resistance training, and fat burning cardio. Anyone can do this even if you haven’t exercised before. You may already have an exercise routine but this may not be working for you. To burn fat you need a good challenging resistance training as well as intense cardiovascular training. You can’t spend a few minutes on a treadmill or an elliptical trainer to burn fat from your body as this doesn’t challenge your access your stored body fat. You need a smart workout plan designed by a professional Los Angeles personal trainer to help you burn fat form your body and maximize the time you spend working out. You need intense cardio to burn the fat from covering your abs. The main thing you need to do is push yourself almost every day to do cardio regardless of how boring it is. Each time you do a cardio workout it will burn a certain amount of fat. You need to consistenly put these workout days in a row. You also have to have resistance training to burn fat. You want to work your major muscle groups. I prefer a split routine over whole body routines as they promote more shape in the muscles. This type of exercise increases your metabolism. As far as intensity goes, you should train at or near your limit to force your body to to build muscle. Muscle burns fat. The more muscle you have, the faster your metabolism will be and you will burn fat more easily. Your diet is also another key factor that will help you lose weight, fat and get your abdominals to show. If you don’t have an effective diet plan you won’t burn fat, or burn muscle instead of fat, which isn’t good. Get a professionally designed nutritional program with monitoring and updates. As your metabolism changes, you’ll need to adjust your diet to continue to be effective. You want to make sure you eat the right number of calories each day. If you eat too much this will be stored as fat. If you don’t eat enough your body will slow down the metabolism and you won’t lose as much fat as you should. You want to record what you eat each day and evaluate the numbers. I and my Los Angeles personal trainers can help you with his if you need it so you get the right eating plan for your needs. You must give up junk food and the sugar in your diet. You will find sugar in soft drinks, cakes, cookies, blended coffee drinks, packaged foods and many other products. Another thing you want to avoid is processed fat. In general, you must avoid all junk food in the diet if you want to have a storing, powerful midsection. 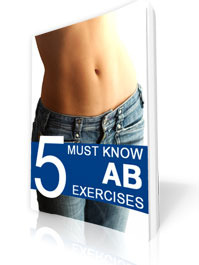 You do have to exercise your abdominals of course but it’s more a combination of diet and exercise that will reduce fat in this area not a lot of crunches. All you need to do is commit yourself to exercise and you can lose weight now, in time for the holidays if you really want to. My fat blasting workout will help you lose weight now so the fat just falls off of your body. You’ll get definition and shape and great results in time for the Christmas holidays. You can email or call me today for a consultation and I will help you reach your weight loss goals. These changes won’t happen overnight but if you make a solid commitment to lose weight and get great abdominals then you can do this. You may have some setbacks but you should never give up. You can get healthy if you put your mind to it so start on my personal training program today.